This week in North Philly Notes, the staff at Temple University Press offer the Temple University Press books they will likely give along with some non-Temple University Press titles they hope to get this holiday season. Give: As we’re immersed in the run-up to the presidential election with a field that includes a strong female Democratic candidate, I’d give Navigating Gendered Terrain, by Kelly Dittmar. If you’re interested in understanding the role of gender in campaigning, DIttmar’s book will give you insight into how candidates of different genders approach communicating their message and why those differences matter. Give: Even though the Eagles may not be having the best season this year (what an understatement!) 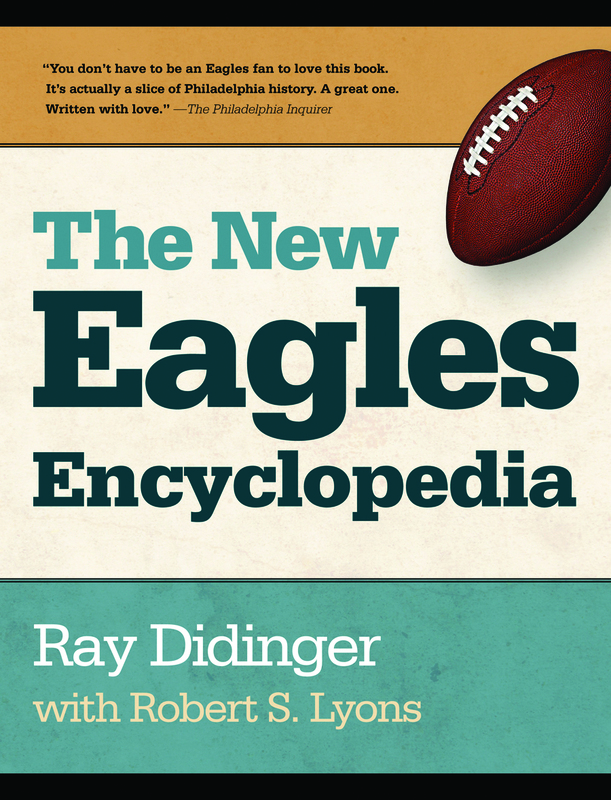 the guys in my family (dad and 5 brothers) are all still die-hard Eagles fans and will enjoy receiving Ray Didinger’s The New Eagles Encyclopedia as a gift and reminiscing about the good old days of the Eagles. Give: This year was an embarrassment of riches for the Press; not only have we had another remarkable year of great books, but our two recently-hired or promoted editors have seen their first titles come out, which makes me as proud of their work as I am of the books they’ve published. For that reason I’d gift Chilean New Song by J. Patrice McSherry and Walking in Cities, edited by Evrick Brown and Timothy Shortell, just to show off what my colleagues have been doing. Another book I’m specifically proud of is Suffering and Sunset by Celeste Marie-Bernier, because it restores Horace Pippin’s place as a critically-important artist, and reminds us of the rich cultural history of our region. Get: I plan on reading The Nature of Things by Lucretius over the holiday break. As we think about what we’re grateful for this time of year, it’s also helpful to remember the world as it is, in all its beauty and woe; Lucretius is always a helpful reminder of this. Give: Eric Tang’s Unsettled to my family and friends and Alexander Wolff’s The Audacity of Hoop to the popular readers in my life. Give: Harold Platt’s Building the Urban Environment offers lessons from recent history for anyone interested in the future of cities. Post-World War II contests between modernist planners and the grassroots over what cities should be suggest that cities must function as flexible, multi-purpose “hybrid spaces,” emerging from more open, less top-down planning processes. We can see manifestations of these dynamics all around us in our revitalizing cities. Get: Revolutionary Russia: 1891-1991 by Orlando Figes, promises a tight, sharp, engaging history of the Russian Revolution. I’m looking forward to brushing up on my history of this period and learning something new — Figes argues the revolution really did last, at least in some form, right up until the collapse of the Soviet Union — and frankly, at just over 300 pages it’s particularly appealing to those of us with small children who also want us to watch SpongeBob with them. Give: Love, by Beth Kephart. It’s a nice combination of history and personal narrative that takes you on a journey through Philadelphia; maybe even introducing you to somewhere new. Get: The Nightingale, by Kristin Hannah. Family, hope, and the unexpectancy of fighting and living in WWII promises both a sentimental and thrilling read all in one. Give: A Guilted Age: Apologies for the Past, by Ashraf H. Rushdy, which examines two types of apologies: apologies for events of the recent past and apologies for events of the distant past. Rushdy explores the question of whether apology and forgiveness undo the effects of past events or the events themselves, and he makes an intriguing argument about the ambiguity between guilt and grief. Get: I would like to receive Philly Fiction 2, edited by Josh McIlvain, Christopher Munden, Greg November, and Tracy Parker: Philly stories by local authors. Give: City in a Park by James McClelland and Lynn Miller. This book provides an education both to those who use the park and to those who have never visited the park. This informative book traces the historical and present-day uses of the park. It is a must for anyone who wants to visit or expand their visit to The Fairmount Park System throughout Philadelphia. Give: City in a Park by James McClelland and Lynn Miller shows how and why Fairmount Park, within Philadelphia’s city limits, with all its history, architecture, sculpture and wild beauty, is such an amazing gift to those of us who live here. Give: I can think of no better gift for my MFA-seeking and Horace Pippin fan mother than Suffering and Sunset by Celeste Marie-Bernier. Get: I’d most like to receive Lisa Randall’s Dark Matter and the Dinosaurs: The Astounding Interconnectedness of the Universe, in which Randall, Harvard cosmologist, suggests a link between dark matter, the extinction of the dinosaurs and our emergence as a species. Give: For my art loving friends, I would give Suffering and Sunset by Celeste Marie-Bernier, a beautiful first biography of Horace Pippin, an African American artist of growing renown. Get: I have already read Ta-Nehisi Coates’ Between the World and Me, but I will re-read it again during the holidays. The book is a chance to step inside Coates’ shoes and experience what it means to be black and male in America, and understand… Peace and love to all this holiday season! Give: A Guide to the Great Gardens of the Philadelphia Region, text by Adam Levine, photographs by Rob Cardillo. I love to give this book to our out-of-town guests with hopes of new memories around Philadelphia and more visits in the near future. Get: Jane and the Twelve Days of Christmas by Stephanie Barron. Jane Austen, a mystery, and Christmas all in one book?? I can’t wait to read this!! Give: As a cinephile, I would gift Samir Dayal’s Dream Machine, as it looks at realism and fantasy in Hindi Cinema. I’ve been impressed with Dayal’s analysis of film as “a mirror and a lamp” because I strongly believe “you are what you watch.” I am encouraged to share Dayal’s insights with others. Get: What I’d like to receive this year is Hanya Yanagihara’s A Little Life which a friend raved about during the Telluride Film Festival over Labor Day weekend. It is my goal to read this book over the holiday break if I get a copy (hint, hint), but I fear it will become my New Year’s Resolution to get it and read it by the end of 2016. Give: James W. Hilty’s book Temple University: 125 Years of Service to Philadelphia, the Nation, and the World to a fellow Temple student or to an alumnus in my family during this holiday season because the book reflects the pride that I have for my university and my excitement to be a student here during a period of such growth and upward movement. HAPPY HOLIDAYS FROM EVERYONE AT TEMPLE UNIVERSITY PRESS! This week in North Philly Notes, Ray Didinger, author of The New Eagles Encyclopedia, recaps the Eagle’s season opener against Atlanta. A season of high hopes opened with a shocking disappointment as the Philadelphia Eagles dropped a lackluster 26-24 decision to the Atlanta Falcons on Monday night. The Eagles offense, which was so dynamic in the pre-season, did not show up until the second half and by then coach Chip Kelly’s team was already in a 20-3 hole. They rallied but ultimately fell short. The Eagles were a popular pre-season pick to make the NFL playoffs and possibly play their way into Super Bowl 50. They were the highest scoring team in the league in their four exhibition games and with quarterback Sam Bradford making his first regular season start, the Eagles figured to roll against a lightly regarded Atlanta defense. Instead, they couldn’t get anything accomplished early. The Eagles had only six first downs in the first half compared to 16 for the Falcons and they were outgained almost two to one. The Falcons had 244 yards in the first half to the Eagles 125. In the second half, the Eagles got their offense untracked and Bradford completed 21 of 25 passes for 219 yards as he brought the team back, but in the final minute his pass bounced off the hands of receiver Jordan Matthews and was intercepted by safety Ricardo Allen icing the victory for Atlanta. DeMarco Murray made his Eagles debut in the defeat. Murray was the NFL’s leading rusher last season playing for Dallas and he scored two touchdowns against the Falcons, but he finished the game with just nine yards on eight carries. Matthews led all receivers with 10 catches for 102 yards. The Eagles trailed most of the game but they had a chance to pull ahead with three minutes remaining. They trailed 26-24 but they had third-and-one at the Atlanta 26 yard line. Kelly called for a handoff to Ryan Matthews, a running back acquired from San Diego in the off-season. Matthews was stopped for no gain so Kelly had to make a decision. Should he go for it on fourth down or send kicker Cody Parkey into the game to try a 44-yard field goal? A successful kick would have given the Eagles a 27-26 lead. Kelly went for the field goal, but Parkey’s kick was wide to the right. It was a disappointing performance overall by the Eagles marked by sloppy play, poor tackling, dropped balls and mental mistakes. It makes their home opener Sunday against division rival Dallas even more important. If fans are looking for a silver lining, there is this: The last time the Eagles won the NFL championship was 1960 and that year they lost their opener to Cleveland, 41-24. They came back the next week and defeated Dallas 27-25 to start a nine game winning streak. One of Philly’s greatest sports heroes died last week. He wasn’t a player on the field, but he made the Eagles one of the best teams in the NFL. I had the pleasure of meeting Jim Johnson while the Press was putting together The Eagles Encyclopedia, and it was a thrill to talk — however briefly — with the architect of the Eagles’ dominating defense. Ray Didinger, co-author of The Eagles Encyclopedia, knew Johnson well, and wrote of his passing — and his genius as a defensive coordinator — in his “View from the Hall” column at CSN Philly’s web site.